As a duo entry, the Kansas Wetlands Complex of Cheyenne Bottoms and Quivira National Wildlife Refuge are one of The 8 Wonders of Kansas because of their vital and international importance as a migratory stop for North American shorebirds! Cheyenne Bottoms is a 41,000-acre lowland basin and is the largest fresh water marsh in the interior of the United States. It is considered the most important shorebird migration point in the western hemisphere. 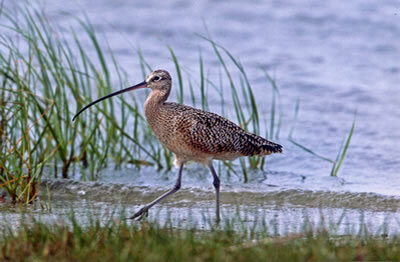 Each year this area attracts 45 to 90% of the North American shorebird population during spring migration. At least 320 species of birds have been recorded. The area is a critical habitat for several threatened and endangered species such as Whooping Cranes, Peregrine Falcons, Least Terns, and Piping Plovers. Thousands of Sandhill Cranes stop here on their spring and fall migrations. 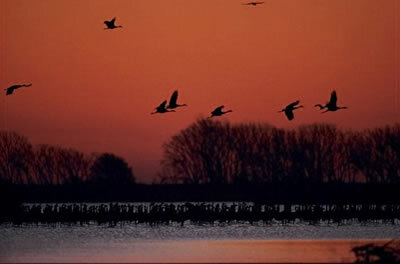 Visitors can drive or walk along the dikes for some magnificent birdwatching. Less than 20 miles away, Quivira National Wildlife Refuge is 22,135 acres of prairie grass, saltwater marshes, sand dunes, canals, dikes, and timber. 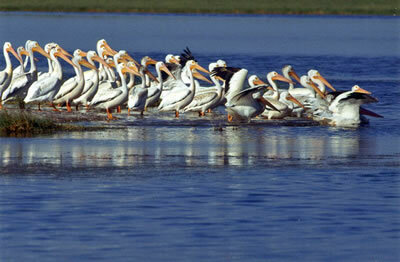 During spring migration, Quivira is a staging area for over 500,000 birds. Big and Little Salt Marshes are ancient basins that have attracted thousands of migratory waterfowl, providing them with food, cover, and a place to rest during exhausting flights between breeding and wintering areas. One good way to see both of these places is to drive the Wetlands and Wildlife National Scenic Byway. It curves around Cheyenne Bottoms and Quivira National Wildlife Refuge for 76 miles. A good beginning point is K-4 and U.S. 281 near Hoisington. Go to ksbyways.org (800.684.6966) for more information and directions. Location: Cheyenne Bottoms is 6 miles north of Great Bend or from U.S. 281 and K-4 in Hoisington go 5 miles south and 2 miles east. Quivira National Wildlife Refuge visitor center is on 70th at the south end of the refuge; or, from Stafford, go 6 miles north of the railroad crossing on N. Main to a four-way stop, then 6 miles east to the Quivira Refuge sign, and 1 mile north.